At long last, the 2017 farmers’ market season is here! A lot has changed, but you can always count on Farm Fresh for All to find out where you can use your SNAP/EBT benefits at Madison-area farmers’ markets! In case you didn’t catch it: El Mercadito de Centro, the Eastside Farmers’ Market, and the Westside Farmers’ Market have all moved to new locations. This year we also welcome a new market to the area– the Elver Park Farmers’ Market on Madison’s west side. Make sure to turn up and show this new market your support! Finally, we have news that the Double Dollars program, which matches your EBT benefits up to $25 at market, will begin on June 3rd. Stay tuned for more information about which markets are participating in this year’s Double Dollars program. 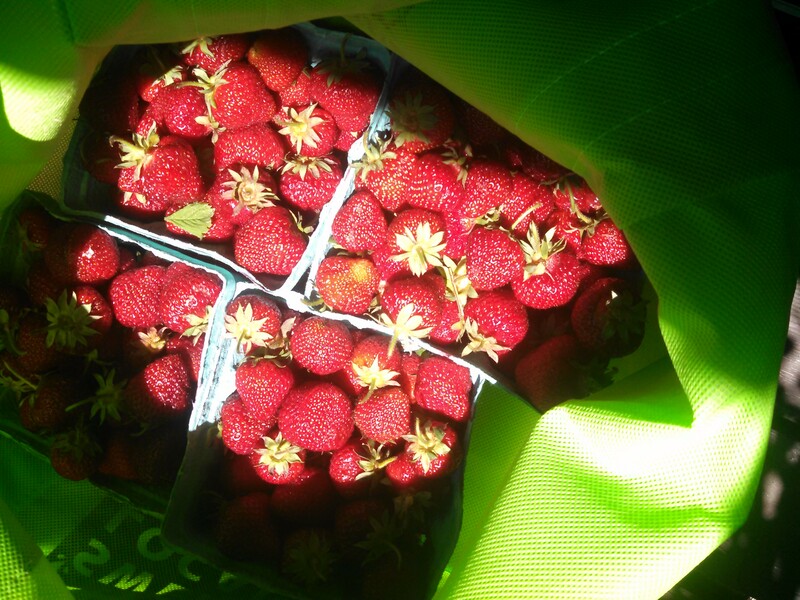 Fresh Strawberries from the South Madison Farmers Market! Thanks for your patience, community! The Markets with EBT page has finally been updated to reflect the 2016 market season. Joining the list of area markets offering SNAP/EBT is the DeForest Area Farmers’ Market. Welcome DeFo! Thanks so much for extending access and affordability in your community. Also, the 2016 Double Dollars incentive program is underway with more participating markets than ever, including the downtown Dane County Farmers’ Market! The list has grown so much that Double Dollars has been given its own page on the site– keep on growing, Double Dollars! Get out there, eat well, support your local farmers, and stretch your benefits! Hello! My apologies for the delay in updating market schedules and information this year. Stay tuned for updates on locations and schedules for farmers’ markets offering EBT, including which will participate in this year’s Double Dollars program. In the meantime, today is the first outdoor market of the season for the Dane County Farmers’ Market. Get out there and enjoy a beautiful weekend! Double Dollars 2015 Kicks Off Sunday! EBT and Double Dollars vouchers can be used to purchase all SNAP-eligible foods (fresh produce, bakery, meat/eggs, dairy, edible plants, and more!) For details and updates, visit the Double Dollars page of the City of Madison’s website or contact Nahrissa Rush at the Community Action Coalition: nahrissar@cacscw.org or (608) 246-4730 ext. 208. “Markets With EBT” Finally Updated for 2015! Despite a sluggish spring, the Markets With EBT page of Farm Fresh for All has finally been updated! Look to this page for up-to-date schedules, locations, and contact information for farmers’ markets throughout the Isthmus area that accept SNAP/EBT/FoodShare benefits. Shoppers can use these benefits to purchase any edible products at the market, and even edible or food producing plants and seeds! A few of these markets will participate in the Double Dollars Program again this year– stay tuned for more info! With funding still remaining for the MadMarket Double Dollars Incentive Program, the dollar-for-dollar match to EBT withdrawals will continue indoors for two winter markets. The Westside Community Market still has two outdoor markets before concluding their season, Saturdays November 1st & 8th from 7am-1pm. However, the $25 match will move indoors with both the Northside and Eastside Farmers’ Markets. Northside Farmers’ Market: Sundays November 2 –December 14th from 10am – 1pm, Northside Town Center at Sherman and Northport. Eastside Farmers’ Market: Tuesdays November 4 – December 16th from 4-7pm, inside the Wil-Mar Neighborhood Center at 953 Jenifer St.
With questions about the program, please contact Nahrissa Rush, Food Security Specialist (Farmers’ Markets) with the Community Action Coalition for South Central Wisconsin, Inc.
at nahrissar@cacscw.org or 608.246.4730 ext. 208. Take advantage of the Double Dollars extension to stock up on your winter storage veggies and late-season apples, you’ll thank yourself later! Autumnal greetings! Summer has flown by, and hopefully everyone has had a chance to reap the bounty of Madison-area farmers’ markets. Fall marks a big change in produce availability, so if hard-rind winter squashes and apples are your thing then your season has arrived. We are also seeing some changes for the MadMarket Double Dollars program, the City of Madison initiative that provides a dollar-for-dollar match to EBT withdrawals of up to $25 at several Madison farmers’ markets. The charming Brittingham Park Farmers’ Market ended its first season on September 23rd, we all hope to see them back in business come spring. Given their closure, the Westside Community Market on Saturday mornings has been authorized to offer Double Dollars incentives. Hopefully this addition will facilitate a greater geographical impact and improve accessibility for even more of Madison residents shopping with FoodShare benefits. In case you need reminders about which farmers’ markets are participating in the Double Dollars program, keep your eyes peeled for these incredible new bus advertisements that are helping to spread the word! But hurry; though several market seasons extend further into the fall, Double Dollars are only available through October. Find out which other farmers’ markets accept EBT benefits on our Markets with EBT page. 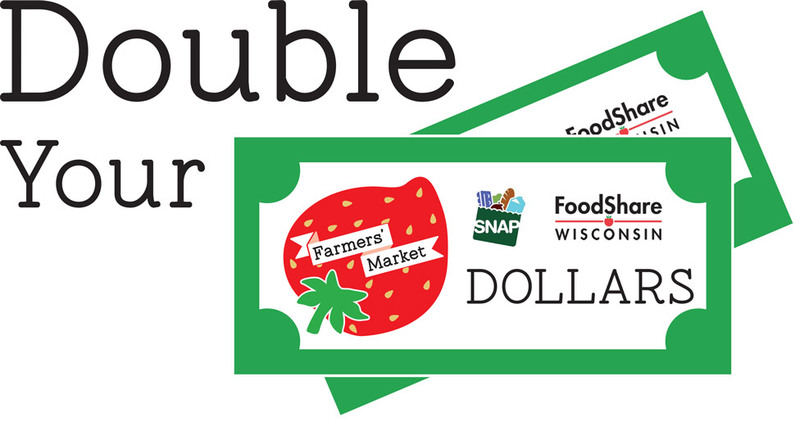 The City of Madison and Community Action Coalition will launch their second season of the MadMarket Double Dollars incentive program this Sunday, August 17, 2014, at the Northside Farmers’ Market on Northport Dr. Customers will receive a dollar-for-dollar match to their EBT withdrawals up to $25 per market day. The distinctive Double Dollar vouchers are in $1 increments and can be spent on any SNAP eligible items, including fresh produce, meats and cheeses, bakery, food-producing plants, and more. The Eastside Farmers’ Market on Jenifer St. and new Brittingham Park Farmers’ Market on West Washington Ave. will also participate in this program for 2014, both markets kicking off on Tuesday, August 19. The Northside Farmers’ Market will host a press conference this Sunday to celebrate the launch of the program season. Last year, when Double Dollars piloted with the Northside, Eastside, and South Madison farmers’ markets, customers received a $30 match. The incentives were funded by partners in the healthcare industry including Group Health Cooperative of South Central Wisconsin, Meriter Hospital, Dean/St. Mary’s, and UW Health to provide a total of $8000 of incentives. This year, funding partners have expanded to include Cuna Mutual Foundation, Graze Restaurant, and Heartland Credit Union to provide $15,000 in bonus dollars. The bigger pot of funds and slightly smaller incentive bonus should help the Double Dollars go further and avoid the risk of running out of funds before the official end of the program. A customer who received Double Dollars at the Northside Farmers’ Market last year told me what help this was to her family, that normally they couldn’t afford to buy meat because they only wanted to feed their children meat that was raised without hormones or antibiotics and grazed in a sustainable way. This program gave them that opportunity. The MadMarket Double Dollars program will run through September 23 at Brittingham Farmers’ Market, October 7 at Eastside Farmers’ Market, and October 19 at Northside Farmers’ Market. Double Dollar vouchers expire at the end of October but can be used at any participating market for the duration of the program. Help spread the word and visit these Double Dollar markets to take advantage of this amazing opportunity!